Our panel of non-experts weigh in on this week's news events in a parlor game to gauge what kind of week America had. Joining us on this week's panel are: Nancy French, author of "A Red State of Mind"; comedian and writer Dana Gould; and Yale literature professor Amy Hungerford. Illinois Governor Rod Blagojevich, whose name we can all now pronounce, was arrested Tuesday on multiple charges of corruption, including trying to auction off a Senate seat, strong-arming the Chicago Tribune into firing staff members and shaking down a children's hospital. Is the Blagojevich meltdown good news, bad news or no news? A $14 billion measure to help the troubled American auto industry passed the House this week but died in the Senate after negotiations failed between Republicans, Democrats, auto executives and union leaders. The bill was supported by the Bush White House, which indicated it may use some of the $700 billion to help Detroit. Was the failure of the bill in Congress, good news bad news or no news? 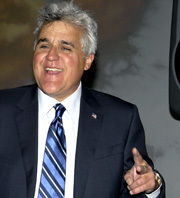 NBC announced that Jay Leno will be staying with the network even after he leaves his spot on The Tonight Show" in May. Leno will host a one-hour variety show every weeknight at 10 p.m. Leno has been a consistent ratings champion and NBC made the move to prevent him from going to a competitor. Is this TV strategy good news, bad news or no news?